We had to scramble with Daniel Pedisich to meet up for a tasting of the wines he imports which in addition to our previous tasting in NYC will all go in to the update for Vinologue Dalmatia. NYC is not the easiest place to get a hold of people on a tight timeline as everyone has a lot of things going on. But, the day before we left, Daniel managed to meet us in the Upper East Side in the evening. He had thoughtfully managed to pick up a pile of čevapi from Astoria which made for our third delicious meal of them in this one week trip. 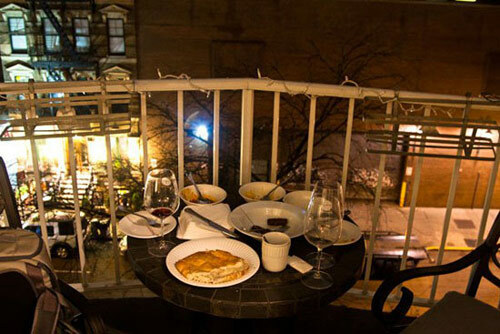 We sat out on the balcony going through a great number of the wines in his portfolio on what ended up being a very warm night in NYC’s early attempt at spring. The overall impression we took away is that Croatian winemakers are really managing to stabilize their vintages. Even as recently as 2007, when we went touring around the country to work on the first edition of the book, the wines were up, down, and all over the scale for some of the wineries. These days, those that were reliable last year were just as reliable this year and will most likely be the same next year. That’s not to say that the taste characteristics of the wines remain the same from year to year at all, but more their overall feel and the general personality of the winemaker can be discerned without a problem. While we’ll write up longer reviews in the guide, it was great to get a taste of Bibich’s Riserva and Grenache again, which are now called the R6 and G6 due to some of the most idiotic naming issues we’ve ever heard of that are out of Alen’s control at the moment. The Riserva continues to be an especially solid, well-structured red with blackberry tones to it and just the right amount of acidity to be really good with most any meal. We also tasted wines that didn’t exist in the country on our last trip, namely a Malvasia (not to be confused with Malvazija which is possibly the same as the Italian grape although in Istria) from Karaman. While similar to others we’ve had from Konavle in overall qualities, its finish is one of the best with just a light, pleasant “waft” in your mouth before clearing out. Lastly we had the Saints Hills which is a very new winery that also happens to be pretty high-ticket as well. The Dingač is a very young wine that is being heavily bolstered by its aging process at the moment given that the vines are only a couple of years old. Even still, the strength of these Plavac Mali grapes from from the Dingač slope comes through. This particular vintage will probably age well for a couple of years and we’ll look forward to future tastings, although the $65 a bottle price tag puts it way out of reach for any kind of everyday drinking. In short, it was an enjoyable evening of tasting and a great way to finish up my trip to NYC. Now we’ll just have to get to Croatia and taste everything in person again once the next year of vintages comes out. We talk a great deal more about the wines of Bibich as well as the other Croatian wineries in our Dalmatian wine guide.